Mt. 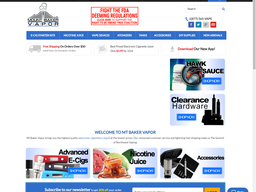 Baker Vapor is one of the leading online stores for electronic cigarettes and other vaping accessories and hardware. The company was established by James Thompson and Jesse Webb in 2011. The founders of the company believed that Vaporizers would be the perfect alternative to traditional cigarettes which damages the health of the smoker irrecoverably overtime. Now, over 150 professionals are hired by Mt. Baker Vapor, they have successfully delivered over 1.5 million orders to their customers across 150+ countries across the world. Make sure that you check the latest mt baker vapor coupons at our website to save more on your order! They claim that all of the e-juice that they produce is made with USDA food grade ingredients the same day you order it. What kind of cigarette alternative products do they sell? They sell electronic cigarette (e-cig) starter kits, nicotine juices, vape devices, atomizers, tanks, DIY supplies, and other vaping accessories. They sell vape devices from many popular brands like #TAGSUP, Aspire, Baker Vapor, Bang Bang Vape Co, Boge, Council of Vapor, EFEST, Infinite, Innova, Joyetech, Kanger, LG, MT Baker Vapor, Nitecore, Pioneer4you, Praxis Vapors, Proart, Samsung, Sigelei, SMK, Tesla, Vapowire and tons of other brands! Mt. Baker Vapor offers a wide variety of shipping methods to their customers. However, the shipping method you’re going to choose isn’t going to affect how fast your order is prepared. Although it usually takes just 1 business day to dispatch your order, it could take up to 3 business days, occasionally. The packages are packaged discretely for your security and privacy. You can order your products using USPS First Class Mail, USPS Priority Mail, USPS Express Mail, UPS Ground, UPS 2nd Day Air, or UPS Next Day Air if you live in the United States. They offer also Free Shipping for all the domestic orders above 50 USD, but this offer may not be always available. You can always find Free Shipping coupons to use at Mt. Baker Vapor at our website! Remember that the Free Shipping offers do not apply to the international orders. All the international orders placed at Mt. Baker Vapor are shipped either via USPS or UPS. The customers have to pay for the customs and duty fees for importing the product. They support First Class International Mail, Express International Mail, and UPS Worldwide Saver which delivers the products from 185 countries to 220 countries. Remember that all orders require a signature upon delivery. They also include a free e-juice on all the orders from the US and outside of the US. What kind of nicotine juices do they sell and how much do they cost? They offer a wide variety of nicotine juices or e-juices such as Berry Crunch Cereal e-juice, Hawk Sauce e-juice, Thug Juice e-juice, Bananas Foster e-juice, Cheesecake e-juice, Chocolate Mint e-juice and tons of other varieties! The price of the nicotine juices ranges from 2.99 USD to 4.99 USD, which is really cheap relative to the prices at the local stores. Is there any way to get a discount on my orders at Mt. Baker Vapor? Absolutely. We update the latest coupons and discounts on Mt. Baker Vapor very frequently and we recommend you to check our latest mt baker vapor coupons often to find amazing deals so that you can save the most of your order. How do I contact Mt. Baker Vapor? You can instantly get in touch with them using their Live Chat during their working hours or you can also make a call to them anytime between 7 AM – 11 PM PST, 7 days a week!